Anyone who's ever writhed in pain after crushing a Lego block underfoot will appreciate Australian-based Luxford St.'s take on the classic Ottoman. 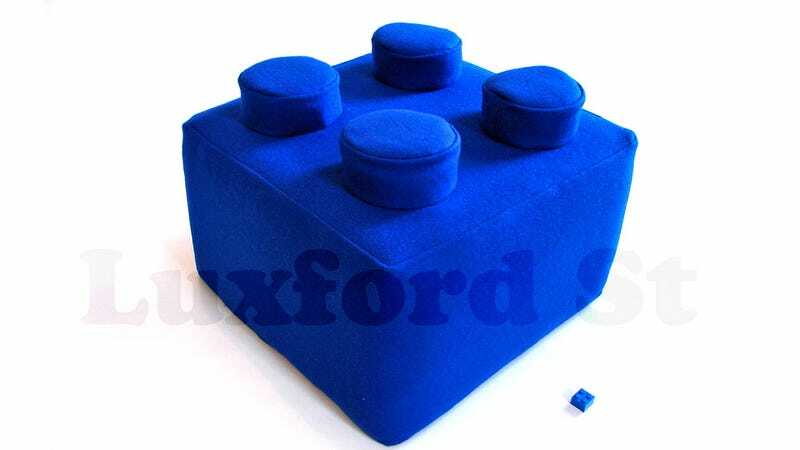 Crafted from recycled pool table felt and stuffed with sturdy polyurethane foam, the footrest is a perfect 20:1 scale version of a size four Lego block and is perfect for putting your feet up. Or building life-sized forts. At $89 it's a great way to scratch your nostalgia itch, but you might want to hold out until this golden yellow Block Bag is available. It's a 10:1 scale version of the classic six-stud Lego block that of course doesn't have to be used for hauling around plastic brick. But why not?